I’m sure you’ve heard of expensive Christmas Presents or trips, like a week on Necker Island, or Neiman Marcus’ 2016 Fantasy Gifts, and lest we forget the Thousand Mile Secrets Amazon Holiday Shopping Guide! Well, if none of those are to your fancy, then perhaps Staples’ Costliest Product could be! Courtesy of Slickdeals, Staples’ costliest product is–you guessed it–an Apple Product! an Airport Time Capsule 2TB! Of course, I don’t think anyone can put a price on an Airport Time Capsule, I mean, those are all of your photos, your keepsakes, your memories. 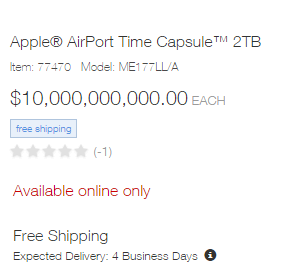 Alas, Staples seems to believe that they can put a price, thus making the Apple Airport Time Capsule 2TB Staples’ costliest product, at a whopping $10 Billion dollars. Personally I’d rather just go to Necker Island a few times over! What is the costliest product you have seen sold online? …also, shipping kills the deal. You’d think at that price point, that they’d just throw shipping in, but alas, the stockholders never relent! Oh, and if you stack portal CB with a 20% off coupon, Ink or simply cash @5%, and 5% staples rewards you can get that down to only six billion! These things sell really well at full price on FBA, but you didn’t hear it from me. Also be sure to check your potal’s terms, since some cap their payouts well South of a million bucks. @Russ – hah! Please do share the portal that you’re using that doesn’t cap the payouts! Ink is great, but its a shame to lose all that 5x on the remaining 9,950,000! If only we could split payment, and get a cadre together, we could max out like, a ton of hobbyist’s Ink 5x in one fowl swoop! That’s a savings of 4 billion dollars! That’s huge – someone get this guy in charge of the US government’s budget stat.